What do you get when a long time race car driver is introduced to a biomechanical crash injury expert? If the two men were Jim Downing and Bob Hubbard, the answer would be the HANS® Device. The development of the HANS® Device with head and neck support stems from a long time association between Bob Hubbard and Jim Downing. After Hubbard married Downing's sister, the two men forged a friendship in their common appreciation of racing and their interest in how the safety in the sport can be improved. In the early 1980's, Downing had initially identified the severe injuries that were occurring when a restrained torso and an unrestrained head were involved in a swift deceleration impact. With the problem identified, he turned to Hubbard to help him design a system that would eliminate or protect against these types of injuries. 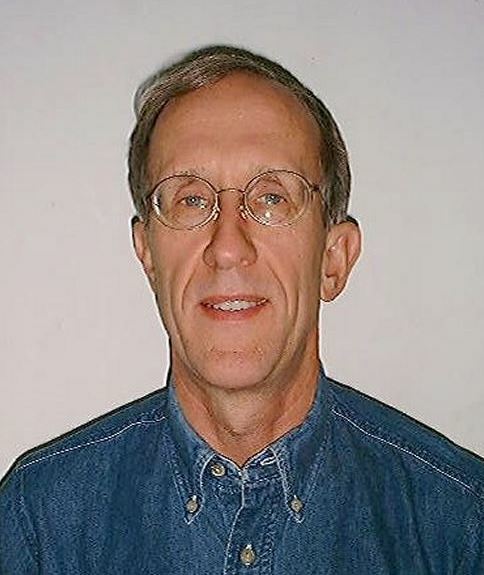 Bob Hubbard has had extensive experience as a biomechanical crash engineer, most notably is his work for General Motors and their safety program. While at GM, Hubbard led the development team that created the Hybrid III crash test dummy head. Being advanced and accurate, the Hybrid III is still used world wide for crash testing. Hubbard drew from that experience and ran Downing's question through his mind. The question was simple enough, but what was the solution? Because of his crash test experience, he knew people move a great deal during a crash even when properly restrained with safety equipment. The solution was to design a piece of equipment that would move with the torso and restrain the head in relationship to the body. He eventually came up with a design that would fit over the shoulders and attach to the helmet. As Hubbard explained, "It was a simple, but a conceptually robust concept, and it works in a wide variety of driver positions and restraint conditions." In the early 1980's before starting the arduous task of designing the HANS®, Hubbard consulted with Dr. John Melvin, his longtime friend. As Hubbard explains, "If you were going to name one guy in this world who was the leader of racing injury biomechanics, it's John Melvin". Melvin has extensive crash injury experience with General Motors, working with their combined racing safety program. Melvin worked on upgrading the cockpits of open wheel cars, installing the CART and IRL crash data recorders and is also on the Formula 1 safety review group. 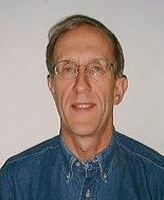 Currently retired and working as a consultant, Melvin thought Hubbard's concept was viable. Hubbard went to the drawing board and eventually came up with a design that "looked sort of like a life vest" that would attach to the helmet and then fit around the neck and over the front and back of the shoulders. While this design was close to what Hubbard envisioned, it was not perfect. One of the problems was that the straps down the back of the shoulders would pull away from the torso during impact and they would also be uncomfortable to wear. One night sitting at his dining room table doodling with what Hubbard termed his "CAD/CAM of the brain"; he came upon the idea to remove the back straps, revealing what is essentially the current HANS®. Hubbard was elated at this "discovery" and had his then 12-year-old daughter help him construct the first model of the HANS® with cardboard and duct tape right there at the dining room table. Hubbard created the first prototypes of the HANS® in the late 1980's, and now that he had a working model, how could it be tested? Jim Downing was quick to volunteer, as a firm believer of the product he had helped to create. 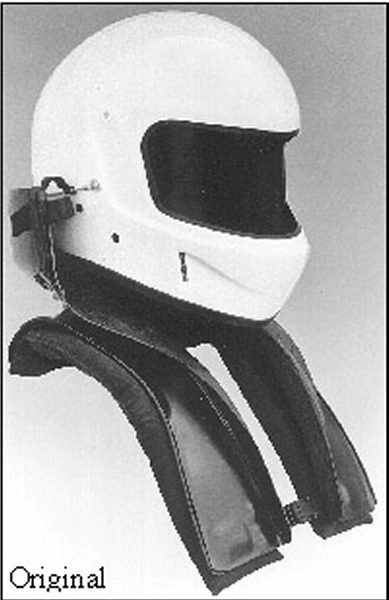 Downing started wearing the untested prototype of the HANS® during his IMSA sports car races. But as Hubbard points out, they had one small problem. Downing didn't crash very often, so they were never actually able to crash test the HANS® in an actual race with Downing as the driver. At the same time that Downing was wearing the HANS® on the track, plans were being made with Wayne State University to test the HANS® using crash sleds. Dr. Paul Begeman conducted the initial tests in 1989, using crash sleds and biomechanical safety dummies. These were the very first crash tests conducted in the United States using a racing harness, seat and helmet. As the test results for the crash tests became available, it was apparent to Hubbard that the HANS® was everything they had hoped for, and more. The amount of stress on the head and neck of the dummy wearing the HANS® was reduced to about 20% of the levels of the dummy not wearing the HANS®. The crash tests had reinforced what Hubbard and Melvin had predicted; the HANS® not only reduced the forces on the neck, but also reduced them to a point where injury would no longer be commonplace or life threatening. Dr. Paul Begeman is still running the crash-testing program at Wayne State University, heading up crash testing for the General Motors and Ford racing safety-testing program with the assistance of John Melvin. The first racing safety crash tests for GM were done in 1993. According to Hubbard, one of the earliest users of the HANS® included actor/driver Paul Newman. "Paul Newman borrowed one once when he was driving a GTP car and he couldn't hold his head up. He had a neck injury. He had a pinched nerve in his neck, and because of the high ground effects and cornering forces he wasn't able to drive. He borrowed a HANS®, actually a pre-crash tested one. The original HANS® had this system of sliding tethers that would help hold your head up in corners, and he tightened this thing up and said this is great. That was probably in 1989". Hubbard was granted a US Patent on the HANS® in 1987 and received a second patent this year with overseas right applied for, and the next logical step after the successful crash testing was to present the product to the racing world as a safety product. Unfortunately, meetings with Simpson and Bell proved futile, even though they were interested, neither company found it profitable to create and market this relatively new safety product. At this point, Hubbard and Downing decided to market the product themselves. Hubbard recalls the conversation he had with Downing, "I remember we were riding back from Road America in Elkhart Lake, and he and I were driving back down through Wisconsin. I just said Jim, I don't think Bell or Simpson or any of these other guys are going to sell this thing. If we want this thing to live we have to start making them and selling them ourselves." So Bob Hubbard and Jim Downing created Hubbard Downing Inc, to develop, manufacture, sell and promote the HANS®, selling the first unit in 1991. After the first units were offered for sale, Hubbard surveyed the users of the HANS® and was amazed at the stories he was told. Time after time he was given accounts of drivers who had survived horrendous accidents and yet received no head or neck injury. But that is not to say the HANS® is a cure all, as Hubbard added, "Don't give the readers the impression that the HANS® is some magical protection thing. No, we don't use the word protect, but it helps people. There is a lot of good buzz about the HANS®, and there are a lot of good war stories, but we haven't had any head or neck injuries with HANS® that we know of." In 1996, Charlie Whiting, who runs Formula 1, called Hubbard to set up a meeting to discuss the HANS®. After the death of Arton Senna in 1994, FIA was making a concentrated effort to improve driver safety. One of the people who were taking notice of the HANS® was Dr. Sid Watkins, the chief medical director for Formula 1. Hubbard decided to arrange the meeting at General Motors with Jim Downing and John Melvin. Formula 1 would respect Melvin's opinion, and his experience with testing the HANS® would convey more than anything Hubbard could say. Also in attendance at the meeting were Peter Wright, retired head engineer for Lotus and a prominent technical consultant for Formula 1, and Hubert Gramling who was from the Mercedes Benz research department. Needless to say, that meeting started a long cooperation between Hubbard Downing Inc. and Mercedes Benz to make a HANS® that would fit in a Formula 1 car. It seems that Mercedes Benz had gotten hold of a broken original HANS® from FIA in England and wanted to test it for their selves. Mercedes Benz had been working on an elaborate air bag system for their F1 cars, but it was very expensive. When they crash tested the HANS® against their own air bag system, the results were amazing. The broken and repaired prototype of the HANS® provided as much protection as their elaborate air bag system, and in some areas the HANS® was better. One problem inherent with air bag systems is that, as Hubbard likes to say, "You only have one bullet in the gun, it only works on that initial impact", but the HANS® works impact after impact, time after time. The tests at Mercedes Benz proved once again the value of the HANS®. Working with Mercedes Benz, Hubbard Downing, Inc worked to reduce the HANS® into a smaller unit, primarily working to restrain the head in a forward motion impact, since the cockpit of the Formula 1 cars could be reconfigured with padding to minimize the side-to-side and backward motion of the head. These advancements led to the development of the current HANS® that is offered for sale today. 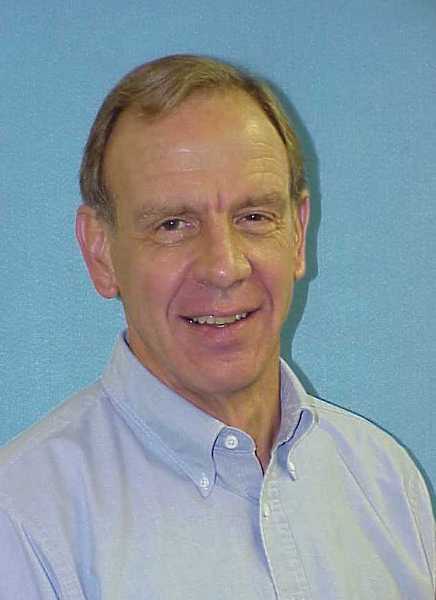 Hubbard has presented several papers to the Society of Automotive Engineers, once at the Motorsports Safety Conference at Dearborn Michigan in 1994 and again in 1998 with the assistance of Herbert Gramling. This year they are presenting two papers at the conference. One on the air bag and how the HANS® Device compares to the airbag, and the other with the HANS® with different test conditions. Hubbard will also give a talk on driver fitting and usage of the HANS® Device. In 1998, Mercedes announced that they were no longer developing their air bag system for Formula 1, even though it showed great promise. The decision was made to use the HANS® for a number of reasons. It was simpler, it worked, and it was currently available. The Mercedes effort to test the HANS® was such an extensive undertaking; it was instrumental in Formula 1 mandating the use of the HANS® for the 2001-racing season. 1. Hubbard, R., P. Begeman, and J. Downing, “Biomechanical Evaluation and Driver Experience with the Head and Neck Support”, Motor Sports Engineering Conf., Soc. of Auto.Engin., paper no. 942466, 1994. 2. Gramling, H., P. Hodgman, and R. Hubbard, “Development of the HANS Head and Neck Support for Formula One”, Motor Sports Engineering Conf., Soc. of Auto. Engin., paper no. 983060, 1998. One thing that Hubbard speaks of is the extraordinary cooperation of the medical officials for the major racing organizations and the sanctioning bodies of Formula 1 and CART to share information. After the loss of Gonzolo Rodriguez and Greg Moore last year in CART, they too mandated the HANS® for all oval track circuits on the 2001-racing season. This was in part to the shared information and cooperation between the two series. This year NASCAR has witnessed the deaths of Adam Petty and Kenny Irwin. Will they follow the steps of Formula 1 and CART and mandate the use of the HANS®? Part 3 of this series will answer that question and more. Part 3 & 4 of this series, The Future of the HANS®. HANS® with head and neck support, is a registered trademark of Hubbard Downing, Inc. Available for sale at Hubbard Downing, Inc, the HANS® Device is available in different models for different race vehicles. At a cost of around $2,000 the HANS® Device is portable and can be used in nearly any type of racing vehicle. Please visit their website or call Hubbard Downing, Inc directly at (770) 457-1046 at their Atlanta, Georgia location, or for technical information, please contact Robert Hubbard in Michigan at (517) 353-5013.